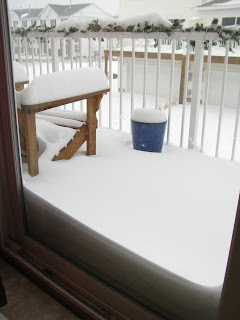 I was hit in the face with a cold wave of shock when I clicked on my blog yesterday and realized I never shared Snow Day: Part 2 as promised. Because I could have sworn I did that. This pregnancy (and the all-too-real dreams I can't shake) is eating away my sanity. So here's the deal. 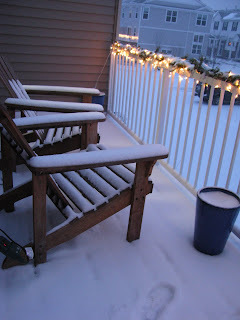 Last week, as I explained in Snow Day: Part 1, we were hit with our first real winter storm. 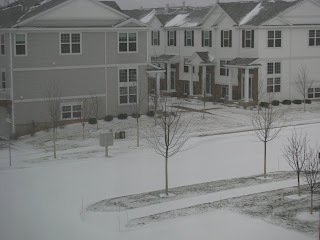 (It's true that we had measurable snowfall in October, but that was freakish and weird. And wrong. So I'm not counting it.) It snowed for about 24 hours straight Tuesday through Wednesday. We were left with about eight inches of snow on the ground. 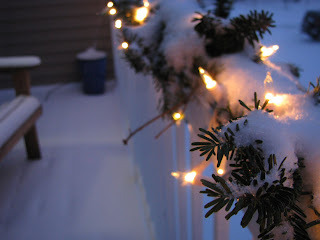 Here are the extra tree greens wrapped in lights (also described in Snow Day: Part 1) that made it onto my deck just before the snow started falling. And here's a shot of my deck before sunset on Tuesday night. It's useful for comparing to the shot the next morning. Here's how much snow we got. My deck looks much the same right now. Thursday, it got wickedly cold -- as in, our highs were around 8 and the wind chill was well below zero. (When we drove to school Thursday morning, in the bright and brittle sunshine, Connor was mesmerized by the thermometer in the van. He counted down every degree as we pulled from our heated garage into the cold. "Twenty-three! Fifteen! NINE! SIX!!! ZERO!!!!" It was at that point I wondered if a six-year-old boy's head could literally pop off from excitement.) So all that snow? It ain't going anywhere anytime soon. And we could get another coating of four inches by tomorrow morning. But you know what? Right now, I'm OK with that. In fact, I'm more than OK with that. I'm thrilled by that. Because here in Minnesota, we do Christmas right. We rarely have to dream of a white Christmas; we just look at our window and enjoy God's creativity. Our kids love the snow. Connor was out sledding on the pitiful little bump at the end of our street on Tuesday afternoon, before we even got anything. To a child, this snow is just a git from God, a beautiful landscape in which to play, laugh, run and create. When I see it through their eyes, winter is breath-taking. Truly. Here's to more snow days*. I can't wait. *This statement expires January 31, 2010. No reminders of such statement can be made after that time. No actual snow days are inferred in the creating of such statement, since Minnesota has an army of snowplows and doesn't cancel school for cold or snow. Ever. The term snow day is to be construed as an expression of freedom and fun only. We had a snowless Christmas ten years ago and it wrecked EVERYTHING. I need SNOW to feel festive. And then I need SNOW to feel miserable in February. LOVE that about Jesus loving the North more as evidenced by our Christmas snow :) Hey, just ask any Canadian, and they'll tell you that they are clearly the favored children. Enjoy the snow. And come back and read this post in a couple of months, to remind yourself of how much fun snow can be. Actually, I ought to do the same! Love the disclaimer at the end. Totally with you. And that whole part about the North and South totally cracked me up. Wow. Sometime I just want to see it like that. And your disclaimer at the end was hilarious! From here in San Jose, California, it looks so pretty! I have never lived anywhere like that; the idea of it seems so surreal to me, like I would be living in a strange dream world. It's very pretty in pictures, and I love what you did with the lights. Ahhh... that's what Christmas is SUPPOSED to look like. I have accepted the fact that, at more that 100 degrees F, we most likely wont have that this year (though I do serve the God of miracles!) 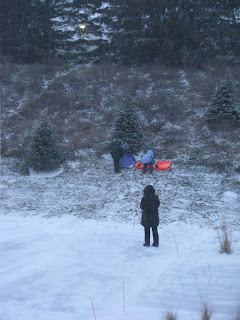 I am learning that I have relied on snow my whole life to get me in the holiday spirit. Of course, this is not to mention the fact that your post made me miss home and you all even more. Oh, dear, just saw your twitter comment about Christmas cookies. It has now been 6 years (crazy!) that I have been [over]induling myself with Mrs. Lovewell Christmas cookies. I may need you to make some in March (I chose the word "need" with thought). Especially those square mint chocolate things. And the ones the kids decorate. And...well, I could go on, but you get the point. The disclaimer made me smile. Because it is -29F here this morning (before we factor in the wind) and I was beginning to think you were a little nuts for liking winter at any point in time. Especially since you drive your kids to school too. That's a lot of boots, coats, scarves, mitts, etc several times a day. In the 12 years I attended school we had one snow day. And that's because it dumped nearly two feet of snow in May and it took them a while to pull the plows out of storage. I am so with you on this as well. I LOVE snow, don't mind the driving and love playing in it with the kids. Once Christmas is over I am done. DONE. We didn't have school on Wednesday because all the blowing the snow in front of the doors and fire marshal called off school! Love your lights on the balcony. They are so, so pretty. The disclaimer is my favourite part of your post. Spring is SUPPOSED to start in February with snow drops (yeah, I did not grow up in Canada, where I now live...) Although I grudgingly admit that if we did not keep our snow until the end of February, it would utterly ruin Winterlude, and I WOULD miss it. Love the disclaimer. Cracked me up. Because it is SOOO true. (And I'm glad someone finally had the guts to say what I've always thought to be true about the North vs South). "Clearly Jesus chooses the North every time." Haha! Love it.